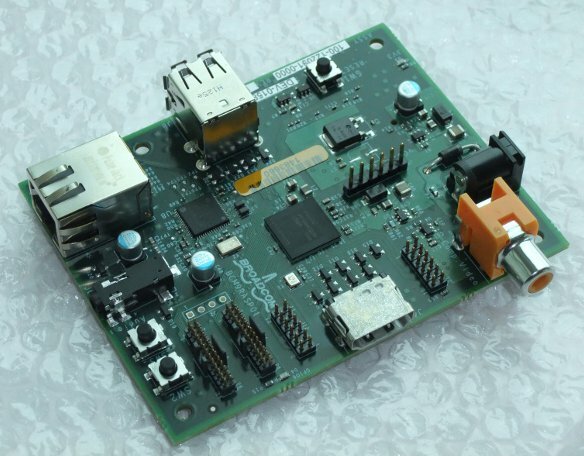 Remember the 25 – 35 USD ARM11 board Raspberry Pi ? Nokia is now getting involved and plans to speed up Qt 5 development on this nice little hardware. The Raspberry Pi Foundation has announced that Nokia would purchase 400 boards next month and give them away to Qt 5 developers who are willing to port software, develop apps, and test and improve the Qt 5 Linux stack. Mostly likely it will be the “high-end” 35 USD version with Ethernet support and 2556 MB RAM as show below. Beside its ridiculously cheap price, the board key features include Linux support, embedded GPU and OpenGL ES libraries that makes it a usable multimedia device capable of outputting 1080p. Nokia and ICS engineers have already started to port Qt to the Raspberry Pi board using the alpha boards. You can see the Qt Quick 2 emitter demo below running on one of the alpha board. Qt has already setup a page dedicated to Qt5 on Raspberry Pi. They’ll show their progress at Qt Dev days San Francisco, next week. If you are a Qt developer, have a project in mind and want to apply for a free Raspberry Pi Board, visit http://wiki.qt-project.org/Qt_RaspberryPi/Device_program and follow the instructions. There are already 95 entries at this time.